The Tria Beauty At-Home Age-Defying Laser Bundle QVC is a great value set that allows you to try Tria Skincare products for free as part of your laser treatment routine. The Tria Beauty At-Home Age-Defying Laser is a non-ablative, fractional laser that stimulates collagen and elastin production, and as a result, periorbital fine lines and wrinkles are smoothed away. The device is clinically proven to be safe and effective for all skin tones and types. However, before you start using the device, do not forget to familiarize yourself with the Instructions for Use in the product packaging for the contradictions, warnings, and precautions. This device is kind of unique, because it is the first laser FDA-cleared for treating different signs of aging at home. The Tria uses the same laser technology used by dermatologists and plastic surgeons. It can be used to treat fine lines and wrinkles around the eyes and smooth the skin on the whole face. 1. Prepare your skin for treatment by washing and drying your face. This will remove any impurities that can block the laser light. Use the Priming Cleanser twice daily. Apply a small amount to dampened skin and gently massage into face for one to two minutes. Rinse thoroughly with warm water and pat dry. Apply the Tria eye cream in the morning and evening to the eye area. 2. Select your treatment level on your Age-Defying Laser. You can start on Training Level 1 so your skin can become adjusted to the sensation of the laser. Then, work your way up to Levels 2 and 3. Once you have selected your treatment level, place the treatment tip flat against your skin and glide the laser slowly side-to-side across the zone you wish to treat. Please refer to the Instructions for Use booklet that comes with the device for more information on the Treatment Zones, as well as other helpful tips on using your laser. Treat your skin five nights a week for 12 weeks. The treatment time depends on the treatment level you are using: two minutes on Level 1; four minutes on Level 2; 10 minutes on Level 3. 3. Follow up with a Tria Finishing Serum that will sooth your skin after laser treatment. 4. Apply Tria Eye Cream around the eye area. 5. Applying Tria Brightening Face Moisturizer to moisturize and nourish your laser treated skin. 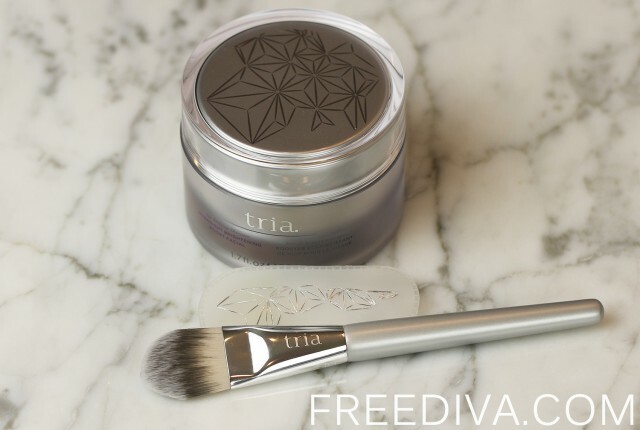 As an alternative, every other day, you can use Tria Brightening Overnight Treatment mask. I found it especially helpful, when my skin felt too dry or flaky.